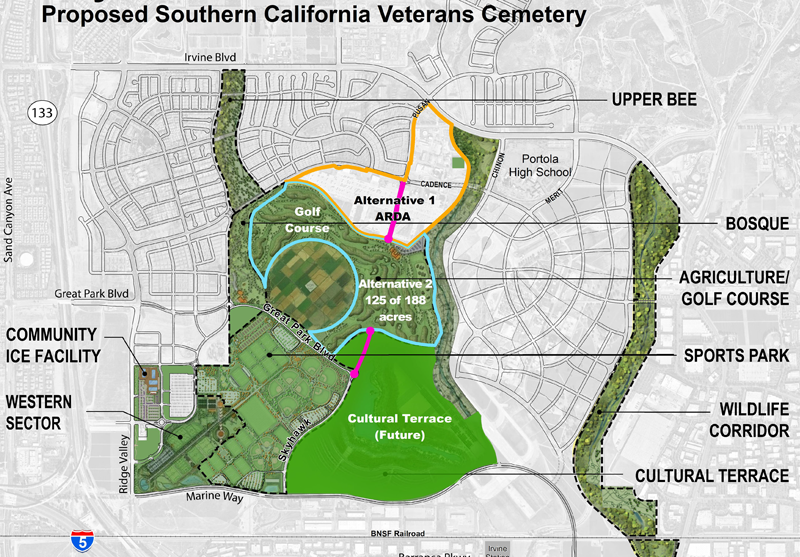 At the July 10, 2018 city council meeting, Mayor Wagner presented a memo that gave each of the Irvine commissions directions on what information to provide to the city council regarding placing the Southern California Veterans Cemetery (SCVC) at the original site know as ARDA. With a 3-2 vote, the memo was approved (Wagner, Shea, Fox–Yes; Lalloway, Schott–No). (c) Prepare an update of expected cost of demolition, clean-up, design, and construction of the first phase of the proposed cemetery plan (as described in the 2016 Concept Plan). As the results of a July 16, 2018 memo from Councilmembers Fox and Shea as well as the subsequent August 2, 2018 Planning Commission vote of 4-1 (Duong, Kuo, Nirschl and Smith in favor; Bartlett opposed), the scope to the staff and the commissions was expanded. The expanded direction stated that the site at the Great Park that is currently designated as the future site of a Great Park golf course be reviewed in tandem as a possible SCVC site along with the review of the ARDA site. Direction (a) to Finance Commission: Review all available sources of potential cemetery funds, (including Great Park Fund 180$*’s presently and expected future receipts). This direction from Mayor Wagner to the Finance Commission was based on the assumption that the first phase of the veterans cemetery at the ARDA site would cost $80 million and that the complete cost of the first phase would need to be taken out of Fund 180. However, it is not clear that the complete cost for the initial phase build out would need to come from Fund 180. Also, if the Golf Course site was chosen, money from Fund 180 would also be taken. Again, more drill down and analysis is needed before any prudent decision could be made. More details on this can be found in the following Direction c discussion. Direction (c) to Finance Commission: Prepare an update of expected cost of demolition, clean-up, design, and construction of the first phase of the proposed cemetery plan (as described in the 2016 Concept Plan). The staff report concluded that the ARDA site cost would be $90,913,014, and the cost of the Golf Course site would be $58,998,929. Staff stated that the needed demolition of 77 existing structures including foundations and the corresponding underground utilities was the reason for the additional expense of the ARDA site. However, this might be comparing apples to oranges, since, as Commissioner Dressler and some others pointed out, this demotion would need to be done whether the SCVS was placed on the ARDA site or the ARDA site was used for another function. This being the case it might not be appropriate to include these demolition costs in the comparison of building the veterans cemetery at the ARDA site vs the Golf Course site. Again, more drill down on the numbers is needed before a prudent decision can be made on the best location for the veterans cemetery. Staffs estimates of costs for placing the SCVC on the ARDA site vs the golf course site can be found on page 11 of the staff report. Also discussed was the possible revenue potential of one site over the other. Since the SCVC will take about a 100 years to complete built out, much of the land would be empty for many years and could possibly be used as a revenue source. But once a site was transferred to CalVet, it would no longer be available for revenue use. However, some thought that this was something that could be negotiated. Again, more haziness on the details and a prudent decision cannot be made with the hazy information currently at hand. It is time to move forward, but more analysis is needed when comparing the finances involved with the two sites. The Finance Commission meeting concluded with a motion requesting that staff find grants and funding resources and determine what the city can afford to pay toward funding the Veterans Cemetery after which the location and details of the project can be determined.